A key factor in bringing about this change was the Islamic Revolution, as, particularly in the first decade or so, bright colours were banished in favour of sombre, predominantly black, shades. But this prohibition did not stand the test of time, and with the younger generation’s natural capacity for fun and excitement, colour gradually crept back into their dress. New fashion designers also stepped in to change the long, loose black robes into a more modern look which would still cover the whole body, and therefore be acceptable. Many of them combined modern styles with traditional designs, yet the material used was almost invariably imported fabrics, often from India or China. This did not escape the attention of a group of young, enthusiastic designers who were interested in creating exciting, new styles integrated with the authentic, traditional patterns and colours of handmade tribal cloth. In the absence of any such material in the market, they decided to produce their own hand-woven textiles. 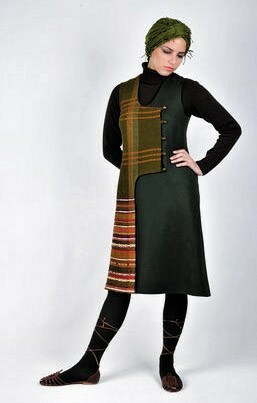 It is a laborious process requiring both creativity in designing the fabrics, and hours of painstaking weaving by hand. The next stage is designing the style of the dress for which the designer has to use her imagination to realize the full potential of the cloth. Each dress, which is better described as a work of art, is absolutely unique and never reproduced. In this multimedia report, two members of this talented group take us through a collection of their exquisite clothes and the various stages of creating them.